A new Board of Directors. The departure of former CEO Ian G. McKay. Record-breaking attendance at the Film & Media Centre’s Digital Careers Fair. The upcoming launch of several flagship projects and reports, including the Green Economy Report, Industrial Insights research study, and the Vancouver Film Commission’s updated assessment of film production spend in Vancouver. Moreover – the launch of a new Industrial Concierge service. The ongoing regional expansion of our Green & Digital Demonstration Program (GDDP), marked by the wildly successful Cascadia Connect workshop at GLOBE Forum 2018. Astonishing attendance and interest in an Alibaba event facilitated by the Asia Pacific Centre. The list goes on and on. We are only just approaching the half-year mark and it has already been a year of astonishing change and achievement at the Vancouver Economic Commission. We warmly welcome these new board members, who will serve a three-year term through to April 2021. Learn more about our board members. 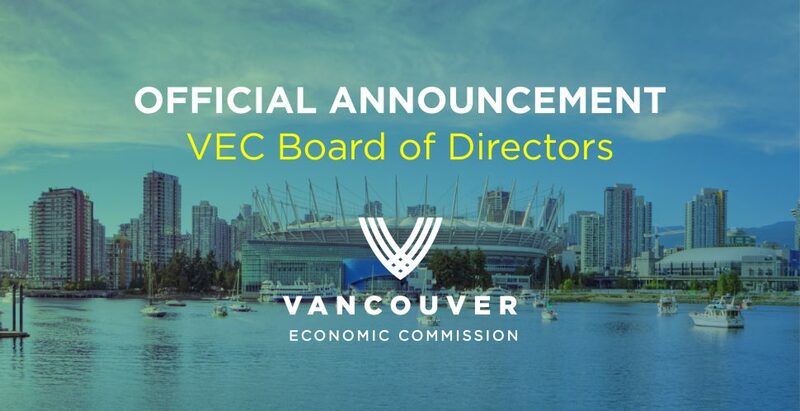 Following the departure of former CEO Ian G. McKay, who resigned his position to take up the reins of federal investment attraction agency Invest in Canada, the Vancouver Economic Commission has begun its search for a new CEO. Our Board of Directors is working with PFM Executive Search to fill the role. In the interim, the Board of Directors has selected Bryan Buggey to take on the Acting CEO role and lead the organization during this period of transition. State of Vancouver Green Economy 2018 report – launched during Sustainable Brands, the Green Economy Report reveals that one in 15 Vancouverites works in the green sector. Profiling over 200 businesses demonstrating innovation and climate leadership, it proves that the work of building a resilient global economy is happening in Vancouver and invites the world to collaborate with us. As always, the Vancouver Economic Commission works for the resilience and prosperity of the city by supporting the most innovative, creative and sustainable businesses that Vancouverites start up, work at, and buy from. We thank you, the business leaders who make this work both possible as well as a pleasure by telling us your concerns, collaborating with us on projects and programs, and join us in celebrating your successes. We look forward to the upcoming months and years.